Need speed? 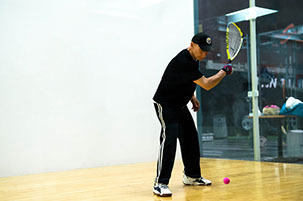 The fast-pace of racquetball will serve up the goods by charging up your cardio routine while helping you engage in some friendly competition. Running the treadmill or riding the bike, trapped inside your own personal bubble, can easily get stale and boring. If you’re looking for a more challenging, intense and fun workout, check out the action at the racquetball courts at ClubFitness. The games are a blur of near-constant, interactive motion. Often overlooked as an accessible method of staying fit, racquetball offers a total body workout as well as the challenge of competition. Playing regularly can improve your balance and flexibility, and help you boost your hand-eye coordination and mental agility. It’s also a great way to reduce stress, make friends and guard against other health concerns, such as high blood pressure, obesity and diabetes. Come join one of our racquetball leagues at ClubFitness Green Valley and test yourself against some of the most dedicated racquetball players in the Triad. Players of all ages and skill levels are welcome.